Donald Trump receives generally negative ratings from the public across a range of personal traits and characteristics. Just 24% of Americans say Trump is even-tempered, while nearly three times as many (70%) say that description does not apply to him. Fewer than half say that Trump is a strong leader (43%), well-informed (38%), empathetic (36%) or trustworthy (34%). The latest national survey by Pew Research Center, conducted Sept. 18-24 among 1,754 adults, finds that Trump gets lower ratings than his predecessors in recent midterm years – Barack Obama, George W. Bush and Bill Clinton – for being trustworthy, empathetic and well-informed. However, Trump fares comparatively well in public perceptions of his ability to get things done. As has been the case since he became president, Trump’s job approval ratings are divided along partisan lines; they are more polarized than any president’s dating to Dwight Eisenhower. 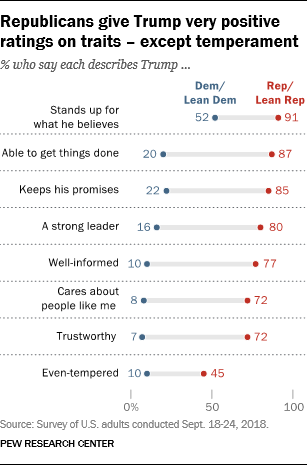 Democrats and Democratic leaners also give Trump particularly low ratings for his temperament (10% say he is even-tempered), as well as for being trustworthy (7%), caring about people like them (8%) and being well-informed (10%). 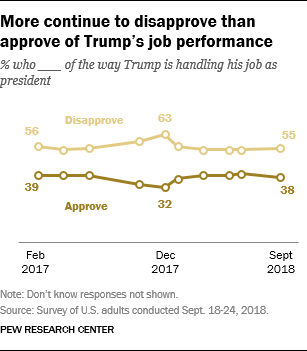 Overall, 55% say they disapprove of the way Trump is handling his job as president, compared with 38% who say they approve of his job performance. Trump’s approval ratings are little changed since June and have been remarkably stable over the first year and a half of his administration. Over this period, Trump’s ratings have shown much less change than his predecessors. Large majorities of blacks (84%) and Hispanics (71%) disapprove of the way Trump is handling his job. Whites are evenly split in their views. Younger adults are more likely to disapprove of the president’s job performance than older adults. And those with higher levels of education are more critical of how he is handling his job than those with lower levels of education. By 67% to 27%, white evangelical Protestants continue to approve of the job Trump is doing. Among white mainline Protestants, about half (52%) approve of Trump’s performance (40% disapprove). On balance, Catholics are more likely to disapprove (55%) than approve (41%) of how Trump is handling his job as president. Ratings are even more negative among the religiously unaffiliated, 71% of whom say they disapprove of Trump. About eight-in-ten Republicans and Republican leaners (79%) say they approve of Trump’s job performance; his ratings are significantly higher among conservative Republicans (87%) than moderate and liberal Republicans (63%). Among Democrats and Democratic leaners, a large 90% majority disapproves of Trump’s job performance, including 95% of liberals and 85% of moderates and conservatives. On trustworthiness, empathy and being well-informed, Trump is rated lower than for his recent predecessors at similar points in the midterm years of their presidencies. For instance, about a third (34%) describe Trump as trustworthy today. By comparison, Obama was described as trustworthy by 58% of Americans in the summer before the 2010 midterm and by 51% in the summer before the 2014 midterm. About four-in-ten (41%) described Bush as trustworthy in August 2006 (the second midterm election year of his administration) and 46% said this of Clinton in July 1994. Similarly, smaller shares now say the phrase “cares about people like me” describes Trump (36%) than said this described Obama and Bush in the three previous midterm cycles. When it comes to perceptions of being a “strong leader,” Trump gets the same rating as Bush did in 2006 (43%) and trails behind assessments of Obama on this dimension in the summers of 2010 (53%) and 2014 (47%). Trump fares relatively better when it comes to his ability to get things done. More describe Trump as able to get things done than said this about Clinton in July 1994 (40%) or Obama in July 2014 (44%); he trails only ratings of Obama in June 2010, when 55% described him as able to get things done. On several traits, the partisan gap in assessments of Trump is wider than at comparable points during the Bush, Obama or Clinton administrations. There is now a 67-percentage-point partisan gap over whether Trump is seen as “able to get things done.” Nearly nine-in-ten Republicans (87%) say this describes Trump, one of the traits they rate him highest on. Republicans today are more likely than partisans who supported the party in control of the White House in the recent past to say the president is able to get things done. In past midterm years dating to 1994, the partisan gap on trait was never more than about 50 points. There also is a 67-point gap between the shares of Republicans and Democrats who say Trump is well-informed. This is a much bigger gap than for past presidents. Democratic ratings for Trump on this trait stand out as historically low. Just 10% of Democrats say he is well-informed. By contrast, 23% of Democrats described Bush this way during his sixth year in office and far larger shares of Republicans described Obama (49%) and Clinton (42%) this way at this point in their terms. The partisan gaps on trustworthiness, leadership and empathy also are at least as wide as any seen in midterm years since 1994, though the magnitude of the differences are somewhat more comparable to partisan ratings for recent presidents. While Republicans and Republican leaners give Trump high job approval marks and rate his personal characteristics positively, many do not believe that GOP lawmakers in Congress have to support his policies if they disagree with him. Overall, 57% of Republicans say that Republicans in Congress “do not have an obligation to support Trump’s policies and programs if they disagree with him”; 39% say they “do have an obligation to do this because Trump is a Republican president.” Views on this question are about the same as they were in April 2017. Younger Republicans are especially likely to say that Republicans in Congress are not obligated to support Trump’s policies if they disagree with them; those ages 50 to 64 are about evenly divided in their views. By contrast, a majority of Republicans 65 and older say that Republican lawmakers in Washington do have an obligation to support the president’s policies even if they disagree. 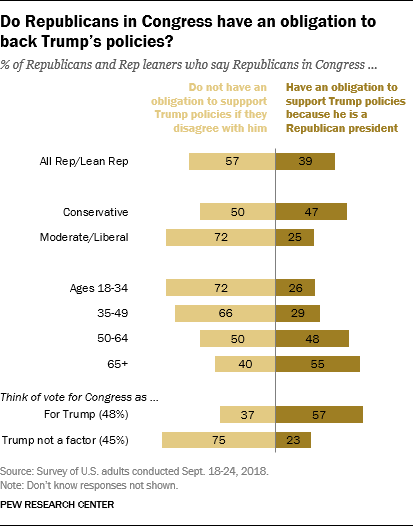 Conservative Republicans and Republican leaners are split in their views: About as many say GOP lawmakers have an obligation to support Trump’s policies (47%) as say they do not (50%). Most moderate and liberal Republicans (72%) say Republicans in Congress are not obligated to support Trump’s policies if they disagree with them. There also is a divide on this between Republicans who think about their midterm vote as a vote “for” Trump and those who say Trump is not a factor in their midterm vote. Among the 48% of Republican voters who consider their vote for Congress as a vote for Trump, 57% say Republicans in Congress have an obligation to support Trump’s policies. Among the 45% of Republican voters who say Trump is not much of a factor in their midterm vote, 75% say GOP lawmakers are not obligated to support his policies if they disagree with them.